standard-title Custom Footwear Singapore | Height Increase Elevator Men Shoes Elevator Shoes for Men to get 7 cm taller height increase invisibly. Custom made height increasing shoes for short man will make you look taller like no other man high heel shoes or lifts, with comfort in your own fit. Elevator Shoes for Men to get 7 cm taller height increase invisibly. Custom made height increasing shoes for short man will make you look taller like no other man high heel shoes or lifts, with comfort in your own fit. Carl & OAK Bespoke, Singapore provides handmade luxury Elevator Formal Dress Shoes for men. Our designer Height Increasing Formal Dress Shoes will increase your height with a hidden heel insert. Not getting much attention. Is Height your main problem and you are vertically challenged? 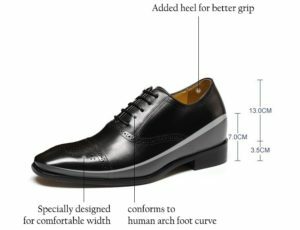 Buy the best height increasing shoes for getting more attention to making you look good, walking tall, and also elude refined style and confidence. Walking tall and standing tall is no more a problem. Elevator Dress Shoes for Men to get 5 inches taller height increase invisibly. 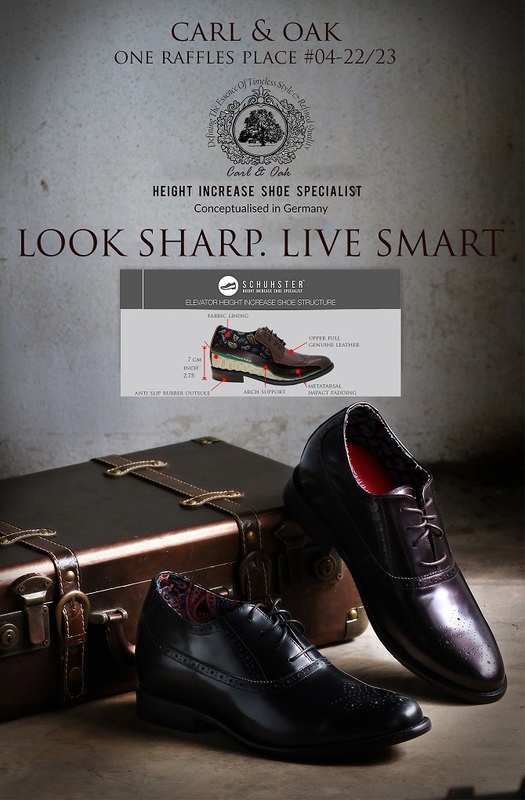 Carl & OAK Singapore‘s height increasing formal dress shoes specialist for shorter man will make you look taller, walking tall without losing any comfort, even at 2-5 inches instantly taller invisibly. Carl & OAK Singapore offers rich styles of height increasing casual elevator shoes for men. Best fashion men taller casual shoes with high quality let you invisibly get taller. Elevator shoes and height increasing shoes with hidden lifts and insoles built in high heel shoes or tall shoes for short height will give additional inches, and with comfort for everyday wear. Be it for wedding & formal bow tie events, boardroom meetings, Carl & OAK Bespoke (Singapore) makes the perfect choice for you. Not just to help in walking tall, our height increase men shoes also can be customized for better comfort and design. ♣ Wear fitted clothes and suits that stay especially close to the body. Most of us have seen this photo before, but never seem to tire of the apt point that it makes. Without question, baggy clothes will stretch the silhouette horizontally, causing a person to look wider, instead of taller. Think about lengthening (instead of widening) yourself from head-to-toe whenever you dress. It’s sobering to notice the transformation that a shorter man experiences when he forgoes his baggy clothing for clothes that reveal a streamlined silhouette. ♣ Lengthen the legs by opting for no break on the pant legs, as slightly shorter pants exposes more of the shoe; both of which creates a continuous, unbroken body line with more of the body showing…which, in turn, makes you appear taller. ♣ Wearing colors within the same color spectrum avoids breaking the body line (with the distraction of different colors), and lengthens the silhouette from head to toe. ♣ Make Sure Your Shirt Doesn’t Pass Your Hipbone. If you’re short and wearing a button down shirt, you should be tucking it in 90 percent of the time. It will give you a slimmer line and make your legs look longer. But, if you absolutely have to un-tuck, or are wearing a shirt designed to be un-tucked (like a T-shirt), make sure that the hem doesn’t go past your hipbone. Anything longer and it will swallow you up and make your legs look stubby. ♣ Practice good posture. If you are slouched or hunched over due to poor posture and bad core strength, you will inevitably look shorter than you really are. Exercise such as yoga, rowing, and other conditioning exercises can help immensely. Walking tall & standing taller can be simply helped with simple habits like these. ♣ The simplest way. Try a formal dress shoe with a hidden height-increase elevator heel. Not only does it make the shorter you taller instantly, it improves your posture as well. Most of modern height-increase men formal dress shoes are not just stylish, but also comes with hidden heels, so it does not look obvious. What shoes make you taller? Well, normal formal shoes already has a typically 2 cm heel. If you are looking for 1 that makes you even taller, you might have to check out specially made height increase men shoes for short men. Where to find height increase heel lift shoe lifts in Singapore and best height increasing shoes for men are another commonly asked questions. Most online eCommerce website sell them, or you could easily find them in shoe stores, as well as our shoe store at One Raffles Place. However, these height increase heel lift shoe lifts sold in Singapore are not recommended for prolonged usage, as it mostly like would add discomfort, with the back heel being too shallow, and very tight inside, long-term knee problem might even result in long term. So it is still wise to spend more for a height increase men shoes, so you can easily stand tall, walking tall, and with much comfort. The entire collection of Carl & OAK height increasing shoes. Shoes for short men that make you taller in 1 seconds only. Carl & OAK Bespoke, Singapore provides handmade luxury Elevator Shoes for men. Our designer Height Expanding Shoes will increment your stature with a shrouded insert. Not getting much consideration. Is height your principle issue? Purchase the best height increasing shoes for getting more consideration regarding influencing you to look great and furthermore escape refined style and confidence. Elevator Shoes for Men get you 5 inches taller immediately. Carl & OAK height increasing shoes specialist for shorter man will make you look taller without losing any comfort, even at 2-5 inches instantly taller invisibly. Carl & OAK Singapore offers rich styles of height increasing casual elevator shoes for men. Latest fashion men elevator shoes, custom made for true comfort and ache support, let you look natural while walking tall. Carl OAK height increasing shoes with hidden lifts and insoles worked in high heel shoes or tall shoes for short tallness will give extra inches, and with comfort for regular wear.Be it for wedding & formal bow tie events, boardroom meetings, Carl & OAK Bespoke (Singapore) makes the perfect choice for you. ♣ Make Sure Your Shirt Doesn’t Pass Your Hipbone. If you’re short and wearing a button down shirt, you should be tucking it in 90 percent of the time. It will give you a slimmer line and make your legs look longer. But, if you absolutely have to un-tuck, or are wearing a shirt designed to be un-tucked (like a T-shirt), make sure that the hem doesn’t go past your hipbone. Anything longer and it will swallow you up and make your legs look stubby. ♣ Practice good posture. If you are slouched or hunched over due to poor posture and bad core strength, you will inevitably look shorter than you really are. Exercise such as yoga, rowing, and other conditioning exercises can help immensely. ♣ The simplest way. Try a dress shoe with a hidden height-increase elevator heel. Not only does it make the shorter you taller instantly, it improves your posture as well. You can buy elevator shoes from our retail shop at One Raffles Place, where we offers both made-to-order handmade height increasing elevator shoes and best selection of off-the-racks height increasing shoes for men you can find in Singapore.